This article describes a communications gateway system, why Linux was chosen for the implementation and why Linux is an excellent choice for similar gateways. Mr. Lane has written a program called picprg to enable you to easily program a PIC microcontroller. Implementing a software location system as a Linux embedded application results in a robust, efficient and inexpensive system. An informal report on the panel discussion held in Santa Clara on July 14. Cisco runs a redundant system of 50 print servers using Linux, Samba and Netatalk. It prints to approximately 1,600 printers worldwide, serving 10,000 UNIX and Windows 95 users, some of whom are in mission-critical environments. The future of Linux in the SOHO environment. Sculptor is a set of audio tools for Linux that manipulates spectra in real time and provides continuous audio output. 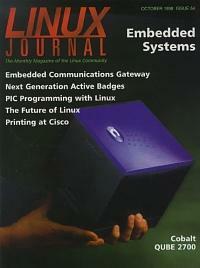 Some background on the ISP and its switch to the Linux platform. A new and fun way to positively promote Linux. All about this compact web server hardware. A detailed comparison of the two office packages, their installations and ease of use. Mr. Lerner introduces us to a template system for Perl: what it is, how it works and how to use it. The availability of Informix SE for Linux was announced at the International Informix Users Group conference, July 22-24, 1998. Mr. Petree brings us up to date on events at Virginia Power, telling us about its Linux substation controllers and new data monitoring system. Mr. Saladino gives us a quick introduction to Expect, a program to help you accomplish your remote tasks. Mr. Nelson gives us step-by-step instructions for loading kernel modules, so we can keep our kernel lean.